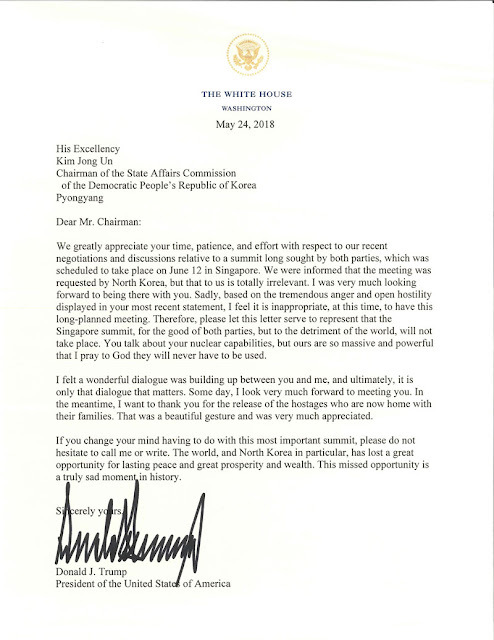 Socio-Political-Journal... : Trump CANCELS Summit! Minutes after pulling out of a highly anticipated summit with North Korea, President Trump said Thursday that the U.S. would continue its "maximum pressure campaign," and warned that the military was "ready if necessary" -- but made clear that a summit could still go forward if Kim Jong Un is willing to engage constructively. “Our military, which is by far the most powerful anywhere in the world ... is ready if necessary,” Trump said. “Likewise, I’ve spoken with South Korea and Japan, and they are not only ready should foolish or reckless acts be taken by North Korea, but they’re willing to shoulder much of the costs associated by operations if such an unfortunate situation is forced upon us,” he added. However, the president clearly left open the possibility of the scheduled summit taking place, despite his letter to Kim Jong Un canceling talks following threats of nuclear action from the rogue regime. The move to pull out of the summit, which had been slated to take place in Singapore on June 12, came after threats from Kim to call off the talks. In a letter to Kim on Thursday, Trump said the world, and North Korea, had lost a "great opportunity for lasting peace and great prosperity." North Korea has for days questioned whether the summit would proceed as planned. On Thursday, Vice Minister of the North Korean Foreign Ministry Choe Son Hui said that whether the U.S. "will meet us at a meeting room or encounter us at nuclear-to-nuclear showdown is entirely dependent upon the decision and behavior of the United States," South Korea's Yonhap News Agency reported. The official also insulted Vice President Pence after he said North Korea had asked for the meeting. "As a person involved in the U.S. affairs, I cannot suppress my surprise at such ignorant and stupid remarks gushing out from the mouth of the U.S. vice president," Choe reportedly said. But officials told Fox News it was the threat of nuclear war -- not the insult to Pence -- that had led to the summit pullout. South Korean President Moon Jae-in, who met with Trump at the White House on Monday, convened an emergency meeting with top security aides on Thursday following Trump's announcement, and expressed “deep regret” over the canceled U.S.-North Korea summit. According to Yonhap, Moon urged the two leaders to engage in direct talks. We "are trying to figure out what President Trump's intention is and the exact meaning of it," presidential spokesman Kim Eui-kyeom reportedly said. Moon said the denuclearization of the Korean Peninsula should not be delayed. The Trump-Kim summit was set to come on the heels of a “historic meeting” between North and South Korea last month, when the leaders from those two nations pledged to clear the peninsula of nuclear weapons. Moon and Kim announced they would work to achieve a “nuclear-free Korean Peninsula,” and also expressed hope to officially end the 1950-53 Korean War by the end of the year, though it is not clear at this point what steps the leaders might take to achieve denuclearization. But Kim’s tune changed last week; he canceled a high-level summit with Moon following U.S.-South Korean military exercises, which the state-run Korean media outlet suggested were a rehearsal for a potential invasion of the North.